But, Sissy did eventually tell Vickie that he wore women’s clothes. Like the time he was beat up in front of their house. And there was that one neighbor who came out with a knife one day and threatened to castrate him. Once, his students dressed up for him. “They all had pink shirts on and either pink or purple hair ribbons,” Sissy recalled. “The whole class. That told me a lot. “Did you ever … think to leave me, because I was different?” he asked Vickie, who admitted they had talked about it, but, she loved him and wanted him in her and their children’s lives. “I know, early on, you were embarrassed to be with me, and I felt so bad for you, because now I’m not the man you married,” he said. Still, did Vickie know she was marrying a fashionista? 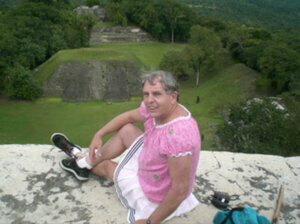 Sissy Goodwin on vacation in Belize. “I didn’t know that I was marrying someone who was going to take up two-thirds of the closet,” she said. Sissy said he knew he could have easily lived like his dad, and become an alcoholic. Where will they be in 20 years? “Probably walking along with our little canes, holding hands, you in your pretty dress and me in my jeans, being happy,” Vickie said. Sissy then told his wife how much he’s learned from her over the years. dear sister, this sissy cannot be more proud of you. sissy has traveled oame of the road that you have, but not nearly as far. sister is an inspiration. sissy loves sissy’s Wife and is serving her without reservation. but sissy has been closeted almost sissy’s whole life. in the last couple of years sissy has been step by step outed by Wife using various means. compared to your beauty sissy is an ogre! sissy knows from long ago what being called fag or queer or homo from past history with another Mistress. sissy has much to do and grow, but sissy wants sister to know sissy’s admiration. This was a wonderful story, and sissy loves the outfits that she was wearing. This girl definitely needs some frillier skirts and tops, Sissy looked amazing.